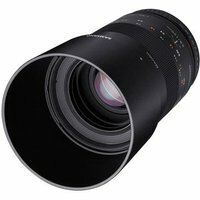 The Samyang 100mm F2.8 ED UMC Macro is a macro telephoto manual focus lens designed for full-frame sensor sizes. The maximum close-up magnification is 1:1. This macro lens with vivid colour and soft out-focusing is the best lens for close-up images of flower and insects. It also can be used as a 100mm telephoto lens for landscapes and portraits. Its f/2.8 aperture creates fantastic images with a shallow depth of field and the smooth focus gear ring allows precise adjustment. Samyang Optics uses UMC technology to reduce flare and ghost as much as possible and get clear and fresh colour image.